A Castillo Esparcia, E Smolak Lozano, A Fernández Souto (2017): “Lobby and communication in Spain. Analysis of the presence of lobbies in Spanish prestigious press”. Revista Latina de Comunicación Social, 72, pp. 783 to 802. Introduction: The paper´s focus is the lobbying reflected in the content of mass media with the aim of diffusing their demands towards political system and in order to participate in the processes of proposals, debates and implementation of public policies. In this way, lobby can elaborate their proposals and advocate their interests. Methodology: In order to find out, which lobbies are present in mass media, which interests are advocated and which newspapers inform more extensively about lobbying, the study of five newspaper of reference was conducted: three general (El País, El Mundo del Siglo XXI, and Abc) and two of economic profile (Expansión and Cinco Días), within the period of time from 2014-2016. The units of analysis were 1058- information pieces, articles, opinion and interviews. Results and conclusions: The results demonstrate that the lobbies with the major presence are those related to economic interests of big companies and business associations- 50% of the analysed content. This has allowed them to insert their demands during the economic crisis in terms of solutions that should be adopted by government. With such a wide presence, they were able to participate in the debates and processes focused on proposing the political solutions from the point of view of their ideological framework. Lobby; pressure group; political communication; framing; mass media. 1. Introduction. 1.1. Pressure groups, communication and lobbying. 2. Objectives and methodology. 3. Research results. 4. Conclusions and discussion. 5. List of References. In the last years information about presence and influence of interest groups in public institutions and public opinion has increased. The role of the interest groups in the public sphere is a very studied matter in the Anglo-Saxon political landscape, but with a scarce research in Spain about the functioning, presence and communicative activity of the interest groups. - the multiplicity and variety of messages makes it impossible that every and each one of events and situations are perceived (qualitative and quantitative) by individuals. Therefore, there must be a reduction of the most concurrent matters through a theme selection of the most pertinent subjects. Likewise, a simplification of proposals presented to improve its understanding and subsequent solution is manifested. - With the aim of framing aspirations of the collective towards those matters that interest different social actors the most (political power, political parties, pressure groups, mass media...). These two reductive processes of the most adequate and pertinent events regarding the peculiarities of every society mainly come from the most significant and socially remarkable associations, as a goal aiming to impose their own, concrete and singular pleas and requests to the community. This action means that the most powerful can access, easier and more strongly, to institutions and subjects who have the faculty and legitimacy of adopting imperative decisions, but in a subsidiary manner, also focus and address their errands on entities that can develop a decisive influence in the process of social decisions (Das, 2004; Berry, 1989 and García Pelayo, 1994). a) Access to power to communicate information regarding public decision makers. A fundamental requirement is to have open doors in the political system. The Law firms, Public Relations agencies, consultants offering connections and potential clients, so they turn into real companies that perform lobbies activities without being considered de iure, but they are de facto. b) Information. The good lobbyist knows the legislative process, is an expert in political debate, provides information about the position of the group in different situations. So, to carry out his job, he needs to know the appropriate language, know relevant people, know how to process different matters, etc. c) Grass-roots mobilization through letters, telegrams or phone calls of citizens towards pertinent individuals, always under the impression of being spontaneous. d) Grass-roots support campaign in all previous actions and over all matters. This support is performed with the purpose of creating a favourable public image towards groups or individuals or to create a specific public demand. Likewise, different studies suggest that the lobbying activity is not exclusive of private interest groups, but also public ones perform that activity (Andersen and Eliassen, 1991; Barron, 2014; Bernhagen, 2014; Bocse, 2013; Gleiber and Shull, 1992 and Baumgartner, 2007). A consequence of that the record of interest groups of the European Union itself establishes a typology called public interest groups. Besides, its increasing presence in the society has led to a situation where the State cannot implement all its policies on its own and needs the participation and cooperation of social groups. However, only bodies, especially legitimated for the creation of imperative guidelines, are in capacity to adopt socially bonding decisions, limiting the participation of associative entities to consultation functions regarding political decisions to be enforced. In a disposition, where the State participates intensively in the society, it is normal that the society tries to influence and act in the State, because its decisions impact to a great extent. This circumstance makes that, even though the State has a legitimate authority for decision, that is, it is the only one that is juridically invested to decide, the groups participate in the process of elaboration, adoption and implementation of decisions through multiple formal and informal mechanisms. It can be said that two phenomena have occurred: a statization of the society (more presence of the State in the society) and a socialization of the State (the society itself intervenes, more and more, in the State decisions). This interrelation between groups and State entails that the current society is not only pluralist, but also must be pluralist. The new functions make the political system participate in modern conversion processes, that is, procedures that transform the flow of demands and benefits of the political system, into a current of extraction, regulation and distribution in the frame of society. These functions are structured through two process such as the articulation of interests and the integration function. a) Articulation of interests is the process where individuals and groups present demands to responsibles of making political decisions. This function is relevant because it indicates the limits between the society and the political system. If the groups that are part of the society do not find the channels to express their interests and needs, it is possible that their demands are not complied with, causing the system to stop receiving support and start losing legitimacy. Easton (1965: 116) has defined the pressure groups, in the same way as political parties, as “structural regulators of the volume of demands”, because these are subjects that control the entrance of aspirations in the political system. This control is materialized in the reduction of volume and diversity of pleas, through the combination of two or more into a single demand. The accumulation of numerous requests, often contradictory, overloads the system, either quantitatively (material accumulation of the number of requirements that the system cannot respond to) or qualitatively (presentation of very complex demands). Every system is equipped with a certain elasticity that bears a specific tension, up to a limit. Among the mechanisms of that system there is the demand satisfaction (has the problem of working with limited resources), reduction of overload by selecting requests and compensating the request excess with the development of social support. The reduction process allows channelling the flow of demands, organizing and reducing them to a limited number of alternatives, which are presented to public decision makers. Similar requirements might be gathered and presented in a disperse manner. The reduction does not consist only in aggregating demands, because it also gathers specific demands in a global request. The synthesis and homogenization allows to simplify and select the multiple demands to be able to perform an action that is adjusted and in consonance with the system’s resources. This regulation of the conversion of social needs into political demands is carried out through two mechanisms: the structural regulation (what can turn a need into a demand) and cultural regulation (what need can be socially admitted as a demand). Through the resource of applying these endogenous and exogenous regulations, every political system can respond, totally or partially, to the vindications and demands coming to it, from the social ecosystem, to its interior. The cultural regulation allows framing demands as requests inserted in the cultural frame of society. Every demand perceives how the easy access to the political system is inversely proportional to the distancing of cultural guidelines. One of the essential factors of the group’s activity consists in making its requests adequate to the political culture of the society it wants to act into. b) Integration function as clear expression that the pressure groups have a vindication function and a latent integration function, because they are subjects of political socialization, of vindications channelling and political communication tool between individuals and governors. The communicative flow established from the societal system towards political instances has been defined by Meynaud (1962: 116-118) as the action performed by the pressure groups, which gather the information circulating in the society and transmits it to the political decision makers. Therefore, aspirations of individuals are integrated whereas, without these organizations, wouldn’t have formalized channels, except political parties, with the subsequent danger of disorganized and violent requests. These functions of the groups in the political system are a tool that coadjuvates to reduce social demands, integrate requests of the system and implement decisions of the public authorities. In the case of Spain, there are regulations and dispositions that acknowledge the articulation of interest groups as set forth in numerous articles of the Spanish Constitution (art. 7, art. 22, art. 28, art. 36, art. 51.2, art. 52, art. 131.2), which means a recognition of the labour and activity of lobbies in the political system. a) The right the public and the public authorities must know organizations or individuals (either acting as lobbyist, the contracting party or the subject recipient of the activity), the funds used (origin, amount and purpose) and the means of action and the set of activities performed to achieve their objectives. b) Guarantee equal opportunities to all individuals and organizations to address requests to public authorities. In this sense, the regulations of the National Commission of Market and Competition (CNMC) and Generalitat de Catalunya acknowledge these two aspects in their own records of interest groups. Andersen and Eliassen (1991: 173-178) highlight the relevance pressure groups have in the European Union and state that the presence and relevance of these groups will increase considerably in the next years and, even more, as there is a normative concretion of community policies. The study of the lobbies in Spain has a certain tradition in the field of political science and sociology (Giner and Pérez Yruela, 1979 and 1988; Molins, 1989, 1993 and 1994). However, the study of lobbies and their communicative strategy has been scarcely studied (Almirón and Xifra, 2016; Xifra, 2015; Castillo, 2011; Casero-Ripollés, 2015; Feenstra and Casero-Ripollés, 2014). a) A passive disposition that starts from the observation of the decision elaboration process, limiting the activity to the moment of the final decision. This trend is clearly negative, because it does not allow to inject group proposals in the creation process of public decisions. b) Carry out an active work in the preparation of proposals during the consulting process. The groups in this situation have the advantage of being successful in influencing proposals and the power of impact in the final decision. c) Aprioristic vocation that allows to identify future decisions and future actions so that, to be prepared and, subsequently, have the potential to minimize inconvenients and maximize advantages. It is the best action a group can adopt, because it allows fighting against the incursion of negative issues for the group, and at the same time, leaving the possibility to suggest their own proposals and not just follow other initiatives. 1.- Define objectives in a clear manner to be able to distribute available resources. Depending on the features of each group, this action will be easier or less easy, because the groups maintaining scarce and limited objectives have more facility than associations advocating heterogenic interests. 2.- Select themes that will be object of surveillance, analysis and intervention. A premise for this stage is the previous information the group has about matters that should be carried out in the future. However, not only it is necessary to intervene with exogenous initiatives, but a hierarchy must be stablished as well as an endogenous mode of action for their interests. a) Inside the public authorities. The action will be different depending on interlocutors, arguments should not contradict over time and must be adapted to the subjects and places where there is influence. The proposals should avoid cornering adversaries, at least in the first moment of action, because a change of orientation from a subject, quite drastically, will resonate in the credibility the public has over that subject. b) Outside the public system, through the public opinion as indirect tool of pressure on decision makers. b) Indirect action with the creation of letter campaigns, Public Relations campaigns (discourses, articles, press campaigns, opinions of social leaders) and use of legal and juridical procedures. c) Use of financial power with the contribution to political campaigns regarding parties and candidates through pecuniary or services contributions. d) Organization of coalitions with the coordination of interests from other organizations to be able to act more strongly. 5.- Once the operation has been produced, the analytical stage begins together with the control and evaluation of everything that has been done so far and results obtained. Every action of a group is an endless continuous process, because the social situation is quite changeable and activities and techniques must always be adjusted to the social perspective of the moment. In the study performed by Wilson (1983) it is highlighted that the incidence of the pressure groups in the Executive branch outstands as main activity of these groups. The ways of connection with the Government are established through formal and institutionalized bodies (Participation in governmental commissions) or informal ones (Informal and private contacts with the governmental representatives). Therefore, the employers gravitate their activities over, and decreasingly, informal and private contacts with Government representatives (72.7%), official meetings with government representatives (69.7%) and participations in governmental commissions (63.6%). However, agricultural organizations base on official contacts with Government delegates (78.6%), governmental commissions (72.3%) and actions over parliament members (23.1%). On the contrary, union associations backup their interventions in campaigns about public opinion (56.5%), participation in governmental commissions (41.7%) and official meetings with Government representatives (41.7%) (Wilson, 1983: 898). The lobby intends to create the perception that the public sympathizes with its aspirations and presented demands or defended causes. It is difficult that, from the public authorities, decisions are made against a group that socially enjoys a strong and generalized favourable opinion. a) Grass-roots campaigns targeted to create a favourable public image towards the group or that allow establishing a specific public demand, so to encourage public authorities to adopt decisions about these demands. b) Trouble-shooter campaigns targeted to influence on the final decisions about actions executed from the public authority. This kind of campaign tries to support actions performed on other powers (legislative or governmental), with a more adding than substituting function. They can also be concreted as prophylactic or preventive errands over actions that might be done in the future. So, communication done by groups or companies is a very important way of creating public opinion, either by influencing directly on audiences, or indirectly, by achieving that media include inside their contents, events or situations that interest the group. In this sense, media gather, interpret, value and disseminate information coming from social associations, as expression of the needs of the societal ecosystem. Likewise, through the informative system, among some mechanisms, the political system perceives the requests of the society that are susceptible of solution. The fact of turning to mass media, allows that groups reflect, in a public manner, their demands, with the subsequent political existence due to the fact that politics manifests, more and more, as a symbolic fight where every association struggles to monopolize and make their vision of the world succeed and promote new pretensions, diligences that coadjuvate the attainment of the group eschatology. - show and introduce themselves as specific subjects with advertisement (make public) of interpellations to their members, since the existence of the express demands of a group is the previous requirement for support and social legitimacy. - under specific situations they can advocate the public’s mobilization, in general, and their members, in particular, to suggest community support that allows a better implementation of the demands presented to public authorities. - present an activity of psychic cohesion over their members, making them participate in a common association. This feeling of belonging is significant in societies participated by a high degree of individualism. - when specific diligences are done on media, one of the premises consists in the intention of educating recipients about matters of the association and the problems related thereto. A middle to long term function that intends to predispose collective behaviours towards acceptance, understanding and interiorizing of group objectives. - the social conflict also has a reflection in the struggles stablished between informative sources to be able to influence in the communicative system. From the set of events that happen, only some limited are exposed, therefore every organization tries that their proposals have a mediatic echo. Besides, to socially irradiate their own objectives, enables restricting the access (qualitative and quantitative) of other allied parties that may be potentially opponents. - as soon as the media written content is penetrated, it should be tried that the image reflected is favourable. It is not so important to get a high level of successes, but that the presence is qualitatively positive instead. - present and advocate as an organization dedicated to a specific theme allows that interlocutors (individuals and media) frame the alliance within the said matter, which afterwards coadjuvates to obtaining a certain monopoly of the concurrent activity. Therefore, we observe the clarifying examples of Greenpeace (environment) and Amnesty International (human rights) which have achieved the identification between association and matter defended. - the foregoing diligences have the eschatology of reaching the acquiescence of media, individuals and public authorities that legitimate the actions implemented by the group. Thus, the group of pressure becomes the subject to be consulted and heard in its field of application. - regarding the political system, they convey an image of the public opinion that offers support to associative requests, achieving a wider force than the real one. We must think that showing itself in the informative space grants the possibility to offer a public image of representation of the group, but also it is a key piece to evaluate the level of social sustenance towards the group’s pleas. Currently, one of the most significative resources are the actions on public opinion (grass-roots mobilization). This technique is a very studied theme in the North American political science, mainly after the emergence of the so-called new lobbying, (Fowler and Shaiko, 1987 and Whiteley and Winyard, 1987). As Hardt and Negri (2004: 95) say that analysing the multitudes and its manifestations (physical or virtual) allow us to “identify the emerging real and creative forces”. 1.- Blend its pleas, proposals and demands on citizens (diffusing function). 2.- Mobilizing aspect over its adherents and sympathizers (mobilizing function). 3.- Psychological variant in relation to its members, granting an image of psychic sustenance. Thus, in a society of increasingly isolated subjects, the followers of groups have the image of belonging to an association with social presence, manifesting coalitions as instances embracing individuals (psychic cohesion function). 4.- Exhibit a representation of social support before public authorities, through mediatic appearances, which convey that the group has a great social presence (social sustenance function). 5.- Stablish and present instructive tools about different problems internal and external to the association (educative function). 6.- Act as sensitizing elements of society about associative themes, in relation to individual and collective perceptions (sensitizing function). 7.- Every group having a certain presence in media in a positive manner, increases its legitimacy to the eyes of public authorities, over their own members, the rest of citizens and the media themselves. The following sequence is intended to be introduced: achieved legitimacy legitimate proposals (legitimating function). The studies in our country about the potential of the digital communication for political mobilization start having a significative relevance (Micó and Casero-Ripollés, 2013, Anduiza et al. 2013, Castillo and Smolak, 2013) and have been focused in movements of social complaint. As Fuchs (2014) mentions in his study about communication and social activism, activists have a complex use of communication which combines off- with on-, with technology and without it, the use of digital and non-digital media. • They are movements based on the multitude that try to centralize their messages in the public sphere. • Anonymous summons and multiple identities with an action of viral communication based on trust, credibility and empathy of recipients-senders. • New modes of collective action based on digital actions and interactions. It is no longer necessary to manage, or does it, the communication strategies through mass media, instead CIT allow a connection and direct links with citizens. However, accessing the spaces of public discussion means to know what media relate with public decision makers. Scholzman and Tierney (1986) have identified 23 formal and informal tactics of contact with legislators like presentations of research results, calls to journalists, advertisement, writing texts for media and parliament members, generate testimonies, organize protests, influence in the political and media agenda, among others. All framed in the strategies of public opinion, social impact, economic impact, legal information and technical information. Knowing the map and type of influence of interest groups with public institutions allows knowing the kind of relationship, because researches demonstrate a variety of access directly related with the characteristics of the different lobbies typologies (Bacheller, 1977; Barron, 2014; Berhagen, 2014; Chari and Hillebrand, 2011; Coen, 2007). Thus, lobbies of economic interest turn more to dialogic type accesses (interviews with legislative and executive representatives, formal and informal meetings, presence as experts, assistance in advisory commissions), while social associations influence on social support (grass-roots) (Bocse, 2013; Carty, 2010 and Dempsey, 2009). Knowing the level of exposure of mass media to the strategies of pressure groups is one of the objectives since the access to media is one of the requirements to influence on political and social elites. With this we can know the typology of lobbies that have greater access to media and what media have more exposure (Harris and McGrath, 2012; Klüver, 2012 and Baldi, 1990). Analysing the presence of lobbies in the mediatic ecosystem is essential because media are basic elements in a lobby’s action (Farnel, 1994). With the bursting of social networks there has been an increase in the autogenerative capacity of producing communication from the associations, but there persists a central role of media, because they are the main informative reference of political, social and economic elites. Different studies focus on this centrality of reference media (Casero-Ripollés, 2015). If we know what lobbies access to what media, we will be able to quantify the number of lobbies with mediatic presence, know the type of interests they advocate (material or moral), how are these communication campaigns and the media that expose more to lobbies. O1: To know the level of presence of lobbies in Spanish reference press. O2: To analyse what typology of lobby has more mediatic presence. O3: To compare the degree of exposure of press to communicative actions of lobbies. To achieve these objectives, we will use a mixed methodology where qualitative and quantitative techniques are used. A research of analytical-descriptive type is carried out where we study the types of information and opinions and describe the representations projected by the Spanish press about lobbies. Moreover, a selection of newspapers is justified since it is the press of reference in Spain and because they are one of the main sources of information of social, political and economic elites in our country. When there is a study about lobbies, the different authors (Wilson, 1983; Micó and Casero-Ripollés, 2014; Harris and McGrath, 2012) comment about the role the press performs in elites and determine the conceptual boundaries about social problems from journalistic framings. To carry out this analysis we will study the main newspapers of general information such as El País, El Mundo del Siglo XXI and Abc and the two main newspapers specialized in economic information such as Cinco Días and Expansión. This selection has been done from the data of the General Study on Media from April 2015 until March 2016, where there is a ranking of printed media and the three main generalistic newspapers nationwide were selected (El País, El Mundo and Abc, in that order), as well as the two most important ones regarding the specialized press (Expansión and Cinco Días). The analysis period comprised the years 2014, 2015 and 2016 and all writing units of media, information, as well as editorials and opinion articles. From the review of the newspapers a total of 1058 pieces object of analysis has been found, writing units where there is presence of some of the lobbies typologies. Therefore, an analysis template of written contents was elaborated for the newspapers analysed, which analysed the type of newspaper (general or specialized information), the type of lobby (economic or moral interest), the name of the lobby, the theme handled and the text’s sources. All this allowed us to achieve the objectives proposed in the research. The results show a constant and recurrent presence of lobbies in the press of reference in Spain. From the perspective as interest groups, pressure groups or lobbies, these organizations have an increasing presence in newspapers that allow us to establish an X-ray photograph of the most active communicatively speaking and of the matters or social problems they participate in. Undoubtedly, from the analysis carried out, the economic crisis constitutes the main issue of interest since the activity and presence of lobbies of economic interest is similar in all newspapers and with the capacity of establishing themes and frames. Just as it has been confirmed through the digitization of contents from analysed media, the presence of lobbies in published information is rather high, because in the years 2014-2016 a total of 1058 writing units have been published (Table 1). In total, during these years, El País is the newspaper dedicating more spaces to lobby (information and opinion) with 28.92%, followed by El Mundo with 27% and in third place Abc with 21.92%. Cinco Días and Expansión are the ones showing lowest percentages of publications in the period analysed with 11.34% and 10.77%, respectively. Considering these data, it seems clear that lobbyists use plenty of strategical planning in public relations. Therefore, these are public relation actions and lobbying is essentially an action of relations with publics which an organization is in contact with. Analysing the newspapers and their impact in every year as shown on table 1, in the year 2014 and 2016, the media offering more information related to the lobbies is the Abc newspaper with a total of 127 and 52 spaces (information and opinion) respectively, which entails 33% and 30% of the total. Followed by El Mundo in 2015 with 45% and El País in 2015 with 30% and in 2016 with 25%, respectively. In third place, we have the economic newspaper Cinco Días with 18%, and 23% in the years 2014 and 2016, respectively. The newspaper El Mundo with a 11% and in 2014 and 16% in 2016 is the newspaper located overall in fourth place, being the newspaper Expansión the last with 10% of publications dedicated to lobby in 2014 and 2016 and 12% in 2015. The number of publications every year fluctuates significantly, but we can detect that in the year 2014 newspapers Abc and El País were the two with the greatest number of publications about lobby (127 and 107, respectively), in the year 2015 newspaper that published more units about lobby are El País and El Mundo (116 and 176, respectively) and in 2016 the ones dedicating more spaces were: Abc (52), (43) and Cinco Días (39). Additionally, when studying the historic evolution of publications about lobby in the analysed newspapers and the fluctuations in the period from 2014 to 2016, we observe that in the year 2015 the greatest number of publications about lobby were produced (391), with the slight increase compared to the year 2014 (384 in total), while in the year 2016 a drop of about 50% was observed in the number of publications about the lobby theme. 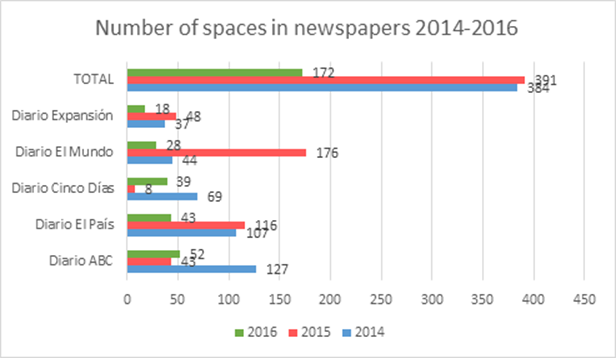 Just as graphic 1 indicates, in 2015 newspapers analysed showed the greatest interest in the lobby matter, being El Mundo and El País the ones dedicating more spaces to lobby this year. 2014 was the second year with the highest number of publications about lobby, in this year the newspapers Abc and El País were the ones handling this issue the most. According to data reflected in graphic 2, the three main typologies in the five newspapers analysed in the years 2014-2016, are employers, public institutions and companies, followed by social lobby and banking. Just as observed in table 2, the main lobbies present on media analysed are the different employers in Spain, such as the sectorial employers on tourism, electric companies, renewable energy companies, car companies, hospitalary, banking, etc. Also included in this aspect is the Spanish Confederation of Employers' Organizations (CEOE). We can see that El País is the one writing more about employers and Abc the least. These typologies of lobbies have a majoritarian presence in all newspapers analysed except for Abc. Undoubtedly, they are the lobbies having more space on media. Secondly, we find lobbies of institutional nature, something that is not so common in the field of these organizations. Most of mediatic insertions refer to local and autonomic institutions and their actions refer to initiatives about an improvement of their own funding and are targeted to the central Government and the European Union. They also work as support to demands of business organizations about political actions regarding investment on infrastructure or regulations in specific sectors, for example, tourism. The newspaper granting greater significance is Abc because it constitutes the main typology of lobby in that media, over other lobbies. In third place, lobbies advocating particular interests of companies is the third typology with greater presence. In all newspapers, they have the third highest frequency of presence. Lobbies of the social sector (NGO, associations) have the fourth place in the rest of newspapers analysed (72). Subsequently, we find lobbies of professional nature (professional association) since there are a total of 49 appearances in all newspapers. We must highlight the great echo the banking sector has in the newspaper Cinco Días and El Mundo (12 in 2014 and 11 in 2015, respectively) and besides, the healthcare employer in the newspaper Cinco Días because there are 10 appearances, while in the rest of newspapers there is much less. Graphic 3 shows that the employer is the most represented lobby (30%), public institutions represent 18% of total mentions and companies 14%. The social lobby represents 7% of spaces and associations 5%. The rest of themes were grouped in the category Others which constitutes 6% of all mentions. The rest of lobbies present have diverse typologies and with a scarce frequency of presence – less than 2% or 1%, like it is demonstrated on table 9. 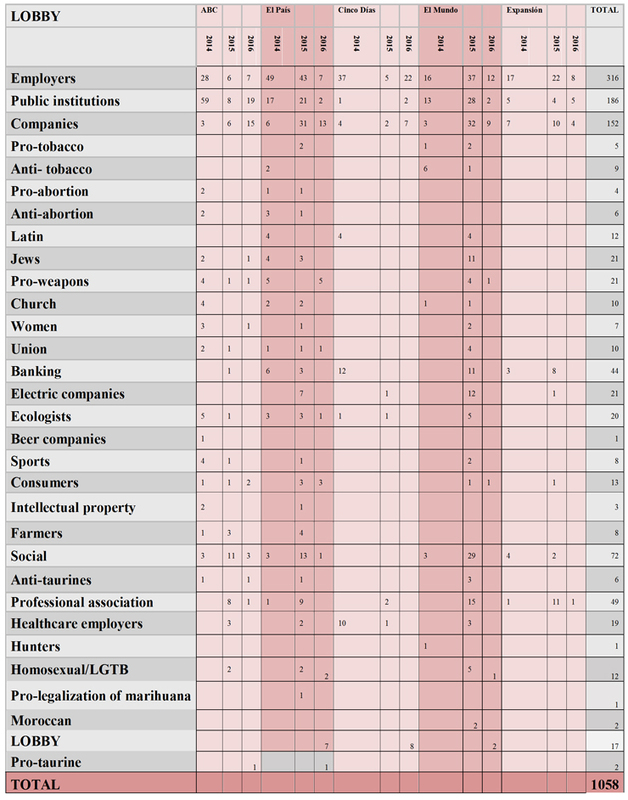 They appear sporadically and usually reflect some event performed or press notice advocating their interest such as, for example, pro-taurine or anti-taurine, anti-tobacco, and recently from 2015, lobbies related to social and collective themes: LGTB, pro-legalization of marihuana and Moroccan lobby. Regarding the typology of lobby that dominates each newspaper, we can see that in the case of Abc, it is public insitutions, in El País and Expansión employers, El Mundo employers and companies and Cinco Días banking and healthcare employer. The typology of lobbies conditions the communicative strategies as Wilson (1983) stated and has been confirmed in this research since there is a predominant presence of business lobbies in the contents of newspapers analysed (Chalmers, 2013; Berhagen, Dur and Marshall, 2015). The presence of lobbies is evident in the fieldwork carried out. Media use this term with profusion, because in the analysed and accumulated period of three years (2014-16) a total of 1058 news have been identified in the media analysed. The newspaper that more presence has in its writing contents in the newspaper El País, although followed closely by the newspaper El Mundo and Abc. However, the distance between them is very short so we can say that the presence of information about lobbies is similar. This trend repeats regarding the number of spaces dedicated to this kind of contents, because the generalistic press is the one that more extension dedicates to lobby matters. There is a greater presence in generalistic media compared to specialized ones in the economic field. 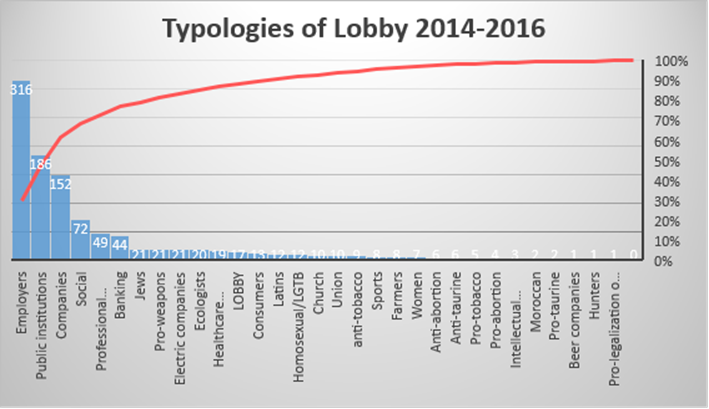 The three main typologies of lobby reflected in the five newspapers analysed in the years 2014-2016, are employers, public institutions and companies, followed by social lobby and banking. In the analysis of presence, we have seen that economic interests have a constant activity and are focused in business associations through employers or through the companies themselves (44.3%). This presence allowed them to actively participate as a source of information of newspapers in the economic crisis and undoubtedly have a privileged role in the constitution of opinions about reasons and consequences of the economic crisis from the conceptual boundaries and proposals of social politics and economic action (Binderkrantz, Skorkjaer and Rasmussen, 2015; Almirón and Xifra, 2016). Considering these data, it seems clear that, keeping in mind the results of the publication, lobbyist use strategic planning in public relations with profusion. Therefore, they are public relations actions and the lobbying is essentially an action of relations with publics which an organization has contact with. Likewise, different studies suggest that the lobbying activity is not exclusive of private interest groups, but also the publics perform this activity (Andersen and Eliassen, 1991; Barron, 2014; Bernhagen, 2014; Bocse, 2013 and Baumgartner, 2007). A consequence of this, is that the registry of interest groups of the European Union themselves, establish a typology called public interest groups. We see that the creation of lobbies of public origin is ceaseless and hence it cannot be said that this organizational typology only advocates private interests. This increase is the consequence that the different levels of political decision influence in the conformation and configuration of lobbies and that these adapt to the formal structure to be able to develop communication strategies targeted to increase its level of influence in the decisions process. The economic crisis has caused the increase of participation of the State in the control of social dynamics, creating new rules regulating the financial and economic activity. The response of interests affected has generated an increase of activity of economic lobbies so to participate in these regulative processes with the purpose of being the least detrimental as possible. *Funded research: Research funded by the research project Lobby and Communication in Spain. Analysis of the communications strategies, from the Ministry of Science and Innovation. R+D National. Project code: CSO2016-79357-R. State Programme of Research, Development and Innovation oriented to Challenges of Society. Bacheller, J.M (1977): “Lobbyist and the legislative Process: the impact of environmental”, The American Political Science Review, Vol. LXXI, nº1, Marzo: 252-263. Berry, J. (1989): The interest group society, Illinois, Scolt Foresman/Little. Burdeau, G. (1982): Traité de Science Politique, Tom III (La Dynamique Politique), Vol. I (Les Forces Politiques), Paris: Librairie Génerale de Droit et Jurisprudence. Castillo-Esparcia, A. (2011): Lobby y Comunicación, Sevilla: Editorial Comunicación Social. Cigler, A. J. y Burdett A. L. (Eds) (1983): Interest Group Politics, Washington D.C.: Congressional Quarterly Inc.
Dion, L. (1967): Los grupos y el poder político en los Estados Unidos, México, Grijalbo. Easton, D. (1965): Esquema para el análisis político, Amorrortu Editores, Buenos Aires. Ehrlich, S. (1971): Le pouvoir et les groupes pression. Étude de la structure politique du capitalisme, Paris: Mouton. Farnel, Frank J (1994): Le lobbying. Strategies et techniques d´intervention, Paris: Les Éditions d´Organisation. Finer, S.E. (1966): El imperio anónimo. Un estudio del "Lobby" en Gran Bretaña, Traducción y estudio previo de Juan Ferrando Badía, Madrid: Tecnos. Fowler, L. L. y Shaiko, R.G. (1987): The Grass Roots Connection: Environmental Activists and Senate Roll Calls, en American Journal of Political Science, Vol 31 nº3: 484-510. Fuchs, C. (2014): Social Media: A Critical Introduction. Sage: London. García Pelayo, M. (1994): Las transformaciones del Estado contemporáneo, Madrid: Alianza Editorial. Giner, S. y Pérez Yruela. M. (1979): La sociedad corporativa, Madrid: CIS. Giner, S. y Pérez Yruela. M. (1988): El corporativismo en España, Ariel: Barcelona. Gleiber, Dennis W. y Shull, S. (1992): "Presidential Influence in the Policy-making Process" en The Western Political Quarterly, Vol. 45 nº2, 441-468. Grant, W. (1989): Pressure groups, politics and democracy, New York: Philip Allan. Hardt, M. y Negri, A. (2004): Multitud, Barcelona: Debate. Haro Barba, C. y Sampedro, V. (2011). “Activismo político en Red: del Movimiento por la Vivienda Digna al 15M”. Revista Teknokultura, Vol. 8, Núm. 2. Meynaud, J. (1962): Nouvelles études sur les groupes de pression en France, Paris, Armand Coli. Molins, J (1989): Chambers of Commerce as interest groups, (working Paper), Institut de Ciències Polítiques i Socials (ICPS), Barcelona. Molins, J (1994): Los grupos de interés en España, Fundación para el Análisis y los Estudios Sociales, Madrid. Molins, J y Morata, F. (1993): “Spain: Rapid Arrival of a Latecomer”, en: Schendelen, M.P.C.M. Van (Ed): National public and Private EC Lobbying, Dartmoutch Publishing Company, England. Schlozman, Kay Lehman, y Tierney. John T. (1986). Organized Interests and American Democracy. New York: Harper & Row. Whiteley, P.F. y Winyard, S. (1987): Pressure for the poor. The poverty lobby and policy makings, London: Methuen. Xifra, J.; Collell, M (2015): “Capturing the recent history of public affairs occupational culture: A comparative case study on the image of lobbying in the early 21st century”. Public Relations Review, 41(5): 696-702. Ziegler, H. y Dye, T. R. (1990): The irony of Democracy. An Uncommon Introduction to American Politics, Belmont: Cole Publishing Company (8ª Edición). Article received on 12 May 2017. Accepted on 9 July. Published on 16 July 2017.